Yeap. I unzipped the coupon and used that coupon. However, during the processing of the order, that message always pops up. Not sure why. Is your virus scan turned OFF ? My virus scan is turned off. Has been for a while. Was your Checkout Price correct after applying the coupon? not "Reinstalling" the old one! If you have trouble with the coupon and your email address the following may help you. 1. Login to your Flight1 account... See http://www.flight1.com/kb/kb.asp" rel="nofollow - http://www.flight1.com/kb/kb.asp if you have trouble logging in. Contact Flight1 Customer Service if required if the above does not help you. Yeap. The price goes to 12.00 and is correct. And I am purchasing, not reinstalling. I will try the customer service link. Hopefully that will fix the problem. I'm having an issue with the install. First, I completely uninstalled my original version of EZCA, cleaned my registry and rebooted to make sure I start with a "clean slate". The install appears to complete successfully but the EZCA2 Config Tool isn't in the EZCA2 folder and the shortcut on my desktop is pointing to the exe being in the EZCA2 folder so it's broken. Also, there's no entry in the exe.xml file for P3D so when I start P3D there's no sign of EZCA. Any thoughts? I've run the install as Administrator. One quick question. When changing the email address on an order, what is it referring to when asking about the 'Order Password'? I'm hoping the animosity I detect in your reply to my suggestions is due more to your unfamiliarity to the English language than to your actual intent. Although I'm not sure I understand everything in your response, I do believe I understand you don't intend to improve on the issues I raised. I'm sure that developing the program is very difficult and frustrating, as is dealing with customers such as myself who raise issues on your softwares functionality. My only intent was to suggest improvements. You, of course, have the option whether to consider them or not. Your customers have the option to use your product "as is" or consider offerings from you competitors, I.E. "Chaseplane" by FSFX Packages. Your success or failure in the market depends on the decisions you make. Product As Is and optimised for background. No interface , Nothing superfluous on the screen to make long flights. Please do not talk about clones of EZ here. Such posts i will delete. I have a team of advanced beta testers (In Russian) and they will tell me as where to make. ! I followed all of the directions, but it said my login was incorrect. I did a password reset, and can now get into the site, but when I try to re-install the software using my Flight1 login to validate I enter my email address and password, and it says the information is incorrect. As I already deleted the old software, I have no other way to validate. I am using the coupon, so I don't want to lose the reduced price by backing out of this now. I do have a valid login and I did purchase EZDok through Flight1. It's on my purchase records. Marniftarr, I for one have not had problems with the program so far. it installed fine in the latest version of P3D. I have had no slow downs when typing in boxes or adding joystick buttons. Only thing that slowed me down for a while was creating joystick buttons for selecting the cameras once I had adjusted a preset that I imported from your DB folder. That problem was fixed by watching a youtube video created from ver 1.8. I am already enjoying version 2, and I thank you very much for the discount. you didn't save your key file or proof of purchase.html? There are two options, logging into your account or providing the key file. I tried using the "Reinstall Using Your Flight1 Logon and Password. My email is correct and my password is also correct, so why is it saying, "The information could not be validated because your account login or password is incorrect?" The order is in my records, and I assume my password is correct because I can login up here. I know you said you turned off virus program, but did you run the installer as admin? gpbarth, I know you keep stating you tried the login account method (which is the lower option) but did you try the top option to offer the keyfile? The keyfile is tied to your account and you can skip the email bit. The order password used to be the last 4 of the credit card you used. First off, I uninstalled the old EZDok. Secondly, I can't find a key file anywhere, unless it's up here on my account. I don't have the data on the card(?) I mught have used for the purchase. I have always used the bottom choice before with no problems. And I keep getting the message that if I back out of this, I'll lose the coupon. Sorry that you can't find the keyfile, I think I've got about twenty backed up. I've got no other suggestions. I guess it is up to Flight1. Maybe Mr. Halpern will jump in again tomorrow. I have bought the EZDOK v1.8 but currently its not installed on my new PC. 1. purchases and download the upgrade and how to use the discount coupon. 2. Should I install EZDOK V1.8 prior installing the v2? Just updated today, noticed that the settings don't carry over from livery to livery for me, any thoughts? Almost like they didn't save. I.v isntalled v2 few hour ago. I had a some mistake that I pasted wrong order number which is ultimate traffic 2. But I realized what happen and repasted correct order number and installing is successful. Above all Fly with HORIZON LOCK mode is awesome. Looking amazing! Thank you so much for the discount! Here's a YouTube video of a first look at EZdok 2.0 if interested. Looking sharp! Помогите, пожалуйста, решить проблему с покупкой? Could you help me to troubleshoot a purchase process problem? Security Check Failed. Please try again later. What wrong I cannot understand. What information that I've provided may be incorrect? I don't have EZCA V1 Installed, I made sure that all traces of it had gone just in case and found nothing, so Im starting fresh here. I have a few issues. I'm using P3D client version 3.4.9.18400. 1) I can't seem to get the Horizon hold feature to work. It's turned on in the EZCA interface but it doesn't work. Tested in the default Baron as per install video. 2) The transition movement between cameras seems quite jerky. Panning with TrackIR or the mouse is 100% smooth, but changing presets by clicking a different preset in the Virtual Cockput camera list is far less smooth? This was not a problem in EZCA v1. Any idea how I can resolve these issues? Just created my account because I wanted to say excellent work! Smooth install and no problems so far (I expect some as what software isn't released without bugs these days!). I set up my cameras in the CS 737 and took her for a spin. It was a good opportunity to set up some new cameras and rethink my button placement which I never did get around to changing from my first purchase. I imported the PMDG 737 and tweaked it for my older bird and the results are great! Much more immersive feeling in the cockpit. Maybe set up a bug report forum which your beta testers can read through people's problems and it keeps the bug reports out of this thread! V2 doesn't seem to work in replay mode which was a time when it would shine most on stream as I got to do cinematic camera work. Please make it work in replay mode again like v1? After some more testing I have to say that V2 is significantly worse than V1 for me.. It's not clear when EZCA saves changes to the aircraft camera preset. I've made the "Pilot" camera for the F22 about 3 times now as it doesn't seem to remember the camera when quitting/reloading P3D. Horizon hold feature doesn't work. UI Is still clunky (as above, I can't create new cameras at all), I used to be able to double click in a cell and write a name to create a new camera in EZCA v1, but that doesn't work anymore. Still can't "Zoom out" on the Virtual Walls UI. There are some wall edges that are off-screen and so their boundary can't be dragged back into the visible portion of the Walls Popup. This has been a problem since V1. Can't scroll or resize the popup windows as per user above. Removing key assignments is still clunky. I have to focus the input and then close the EZCA View System popup before pressing another key to remove an assignment it seems? Sometimes switching to an "Aircraft" camera after being in a VC camera switches the view to the build in P3D Fly-By Mode View, you have to click the aircraft camera again for the correct camera to be loaded. Why do i now get a popup saying "The parameters has been edited do you want to save settings?" Doesn't it autosave changes like EZCA v1..? I've tried running EZCA as admin, rerunning the EZCA config tool, switching SimConnect versions (the latest I have installed is 10.0.61259.0) but nothing help. Have you had any response as I am having the same issues? Unfortunately after installing EZdok v2 there doesn't appear a config.exe file. I installed as admin so that can;t be the problem. OnlineHelp-->Links-->HORIZON HOLD - absolutely new feature. How to use it ? Floating camera will support in a middle of Feb.
2. Horizon Hold need to assign Jou button. 3. UI... double click is removed from UI. It generate bugs. Bugs or no bugs ? Please your choice ? Open aircraft.cfg file from your aircraft where this bug arise , then delete all unused camera sections. It is a conflict that the cameras installed developer. I am unable to delete them without your knowledge. Do this manually or send me aircraft.cfg from your plane and I will remove these sections manually. Correctly. 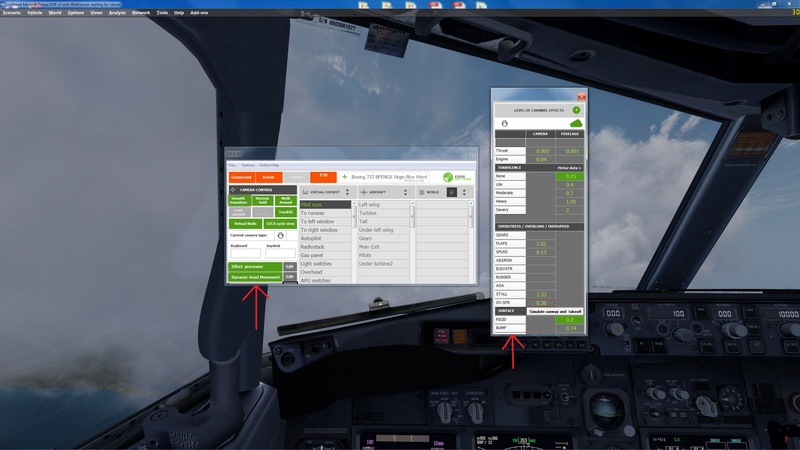 The settings of VC Aircraft and worldcam for mouse and keyboard is different. No more autosave. Forgit please... You working with copy of set. For this feature For this option users have voted 99.9%. Please open OnlineHelp - links for get more info.. Periodically, there are new answers arise. Thanks for the update and the update offer when it comes to buying the update. I'm considering to buy but 2 questions are important for me. 1 is does the worldcam work in P3D even if I'm using an old version of FSrecorder for replay? 2 can I install over the 1.18 version or do you recommend me uninstalling the old version first? I got the copy/paste camera thing sorted out. I have to say, not sure why you'd want to require someone to click a button for the Horizontal Hold. One more thing to remember...I don't have to click a button in the real world to turn my head. Still, it works really well when it's on. Strongly urge that you have an option to have it on without a button click. Another thing. I have an 8 position hat switch I use in button mode. It'd be nice to have an option to use all 8 positions. One last thing, how do I turn off all the bouncing around on the runway. I keep turning things off but not the right things and my 777, is bouncing down the runway acting like a 172. I know I must be missing something. Still, overall, it's nice from what I see. EDIT: Is the bumping around related to the Aircraft Speed set in the Surface setting? Should get rid of those arrows as they don't work and aren't needed. Everything seems to be working fine and really like V2. But i have one issue where unless im in Edit mode i cant seem to move around the vc using keyboard keys (up, down, left, right, page up, page down) in any view. Please disable your antivirus and reinstall Ezdok. My antivirus deleted this file upon installation, because it was considered as infected file. I disabled my antivirus and excluded the installation folder on my antivirus scan setting, then reinstalled ezca2 and everything worked fine. No reply/solution yet. I'm seeing the "turn off your AV" suggestion but I've excluded the install folder and the install file and I still have the same issue. 1. I not tested this with FSrecorder , but i not see problem for using together. V2 tested with built in recorder only. This is will disable old EZ in autolauch. You want enabled Horizon Hold always ? Or autoenable after take-off? Is the bumping around related to the Aircraft Speed set in the Surface setting? Yes in the surface settings. I do not understand about arrows. Tell me model of your mouse. You second person who have problem with MM button probably. I have the same problem: no config.exe. I hope they'll give us a solution! Did you have Antivirus on during EZ install? Thanks for V2, install was buggy but, every system is different and with all add-ons anything can happen. In my case, easy, uninstalled, fixed exe.dll and checked dll.xml to be on the safe side. GUI looks cool and although don't have time now, will post later. Please Marnitfarr keep calm and plow ahead, you're doing great stuff, thanks for discount and being on top of this forum! I'm liking v2 though it will take me some time to be able to use it as quickly as I did v1. On my machine the edit mode is acting weird. Sometimes it works when I press Num2, sometimes it doesn't. And when I'm in edit mode the mouse scroll wheel for adjusting the zoom level is also spotty. Sometimes it works, then it doesn't. Yes I have problems with the edit mode and mouse zoom in FSX Box edition. The mouse zoom is not working at all! In P3D no problem to use the mouse wheel to zoom and edit. It's working very well for me but does not work when doing a replay. V1 worked beautiful in replay mode. Will this be fixed? All ok with edit / mouse wheel zoom .. default EZv2 setup. My problems are in P3D v3 - latest Hotfix2.